When you get older, you tend to forget the things that animated you as a child: your fears; your relationships with your parents; how new and strange so many things in the world seemed. 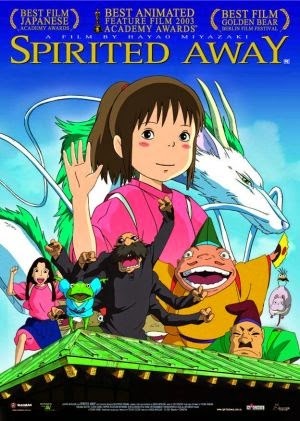 In "Spirited Away" (2001), Hayao Miyazaki of Ghibli Studios manages to capture and portray the sense of wonderment and unease that so many of us felt we had left behind forevever. Chihiro (Daveigh Chase) and her parents (Lauren Holly and Michael Chiklis) are moving from their city to a Japanese town in the countryside. Her father makes a wrong turn on the way and they wind up stuck in a tunnel. Rather than rush off and leave, they decide to get out and look around. On the other side of the tunnel, they wander into a ghost town. Getting hungry, Chihiro's parents smell some food and find a restaurant that is deserted but that has food ready to be eaten. They sit down to eat, but Chihiro wanders off to explore. During her walk, she meets a young boy, Haku (Miyu Irino). He warns that her parents should not eat the food or something bad will happen to them. 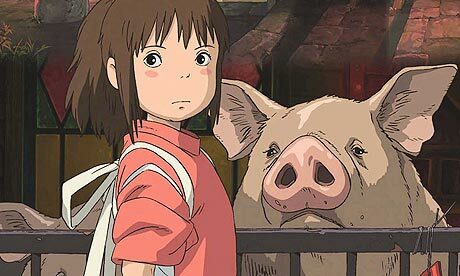 Chihiro rushes back, but finds that her parents have been turned into pigs. Not only that, but it no longer is a restaurant: instead, now it is a strange bathhouse, populated by spirits, monsters, ghosts and gods. The witch Yubaba (Suzanne Pleshette) owns it. 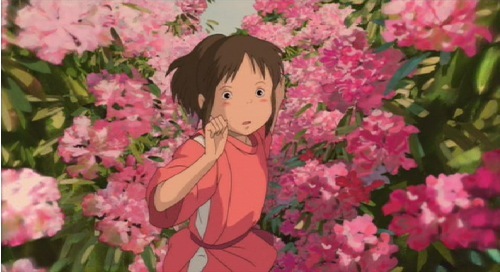 Chihiro must rely on Haku to help her save her parents and return them to the normal world. This is traditional, hand-drawn animation. There is great attention to detail, and the story itself is wonderful and compelling. 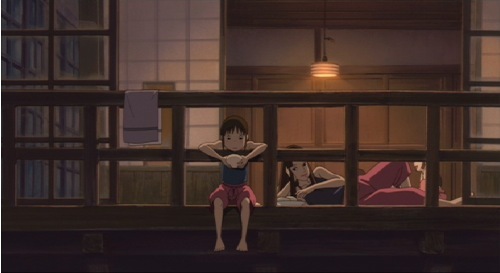 At the beginning of the film Chihiro is unsympathetic, a spoiled, whiny brat. 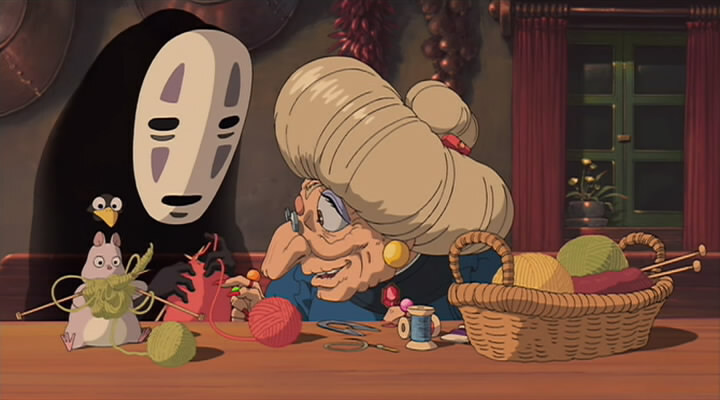 Thinking only of herself, she could use a dose of reality, or at least fantasy-reality, and that is exactly what she gets in "Spirited Away." 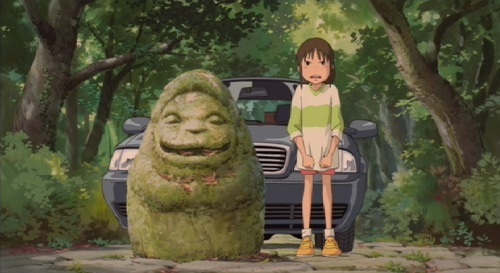 Chihiro comes of age in "Spirited Away"
Her adventure in the spirit world transforms and matures Chihiro, and by the end of the film she appreciated more of the world and becomes independent, respectful and self-assured. It is a "coming of age" story that may be read as a metaphor for many other things. Miyazaki also makes subtle points about Japan itself changing from a beautiful, pastoral place to just another urban jungle. This has even greater resonance now, after the natural disasters that have overtaken Japan. That this touched a nerve in Japan is undeniable. 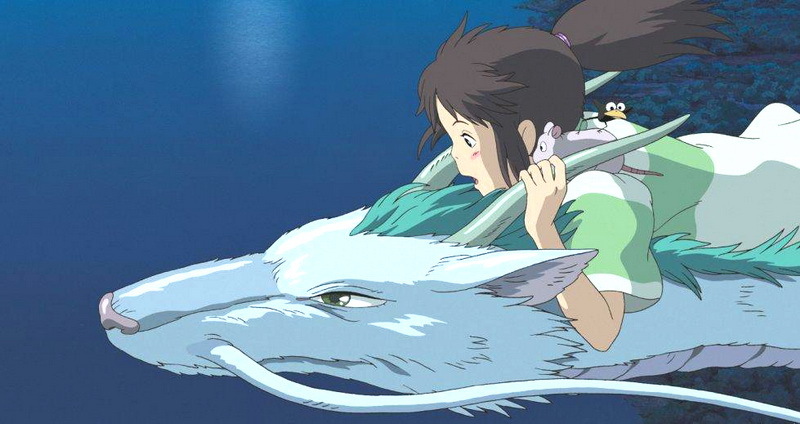 "Spirited Away" remains the top grossing film in Japan all-time. It took in an astounding $300 million (based on current exchange rates). Even "Frozen" hasn't been able to touch that in Japan. While Japan is very open to foreign films, some works, such as this and 2013's "The Wind Rises," are just special there. That both of those films were from the master, Miyazaki, is a touch ironic, because he has a reputation in Japan of having a Western orientation. However, it took this Western-oriented Japanese director to touch the Japanese soul repeatedly. The animation is epic in "Spirited Away"
This was Suzanne Pleshette's final film, and she is wonderful as the witch, Yubaba. The score by Joe Hisaishi is beautiful, but unobtrusive when appropriate. At times, it imparts a dreamlike quality with only a muted piano playing, in keeping with the film's theme. Highly recommended, especially for mature audiences who enjoy animation. 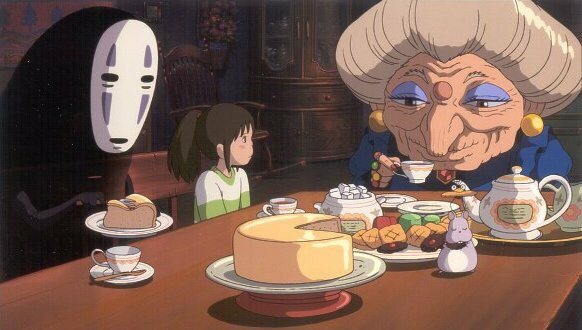 Below is the trailer for "Spirited Away."